Salespeople often get a bad rap for resorting to all kinds of tactics to get us to buy products we might not need or want. But Chris Ortolano is a different kind of sales leader. He's passionate about training a new generation of sales representatives, with a completely buyer-centered approach. This is the reason why he founded SalesStack.io, a public Slack team for B2B SaaS marketing and sales practitioners, with over 1500 members from more than 20 countries. The open forum connects marketing and sales practitioners with daily QA sessions, weekly webinars and monthly newsletters to provide answers to their most challenging problems. 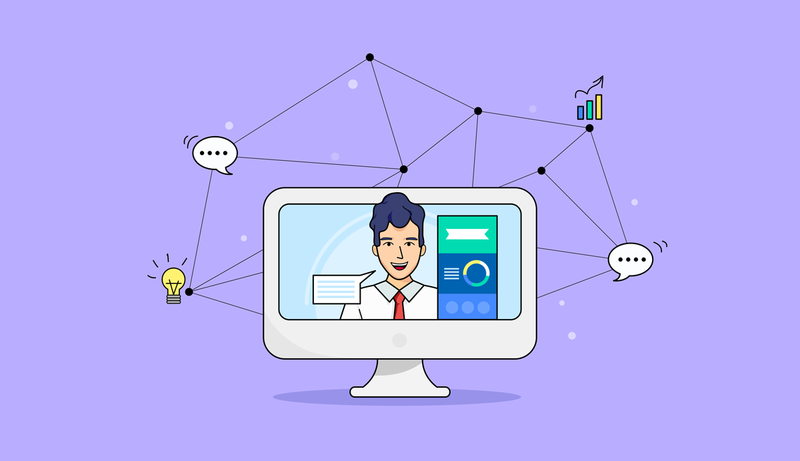 As a sales coach who leads workshops and trains remote teams, Chris realized he needed more effective ways to visualize ideas and transfer knowledge. He found Visme one day and started using it to create engaging infographics and presentations to communicate new concepts to sales professionals from all over the world. 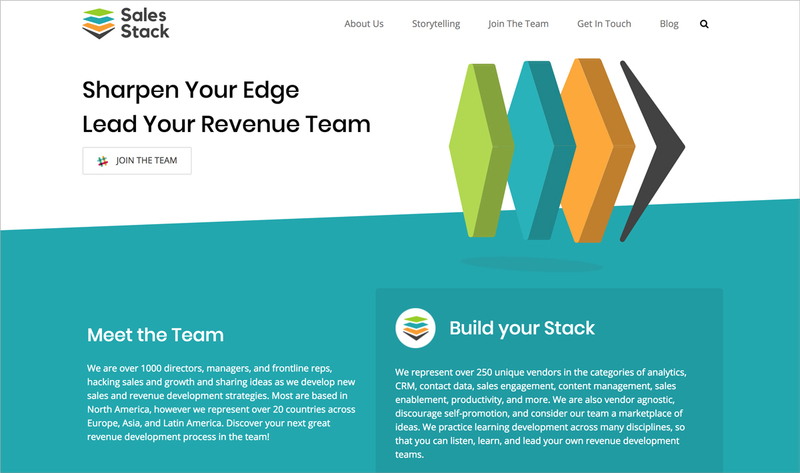 For those who are unfamiliar with SalesStack, tell us a little bit more about this community. SalesStack provides real-time interactions for support and networking between B2B SaaS professionals. As the founder of SalesStack, I meet and connect team members with each other every day. We crowdsource answers to technical questions related to marketing and sales force automation. We then publish the best Slack chats on sales operations, sales development, sales storytelling and growth in a video newsletter. We’re also testing new ways to connect buyers with vendors to increase purchasing between SalesStack team members. How did you first realize that you needed more effective methods to communicate ideas and transfer knowledge? I first learned about visual communication at SD Expo, an annual conference held in Portland, Oregon every summer. One of the breakout sessions explained how infographics could be used to communicate a complex process using images and text. At first, I thought that infographics were primarily used for marketing and did not really consider other applications. As I began to lead workshops and train remote teams, I saw the need for better communication methods. I compared Visme to other category competitors such as Piktochart, and preferred the presentation and infographic templates that Visme offers. After I started using Visme, everyone inside the organization, including the CEO, Payman Taei, was very helpful and willing to connect. What tool or software were you using before to create visual content? Why did you switch? Prior to Visme, I used PowerPoint and Google Slides to create “bullet point” presentations. I know how ineffective list-based presentations are. However, I had never created any visual content before. Once I started producing workshops, I needed a better way to present technical information without putting my audience to sleep. Visme allows me to quickly summarize complex workflows and create much more engaging, and memorable, presentations. I use Visme to enable B2B Marketing and Sales teams to do a variety of things. One is to promote sales storytelling as a messaging strategy to increase engagement. For example, here is one infographic I created to illustrate how to apply the Hero's Journey, a classic story structure, to the buyer's journey. 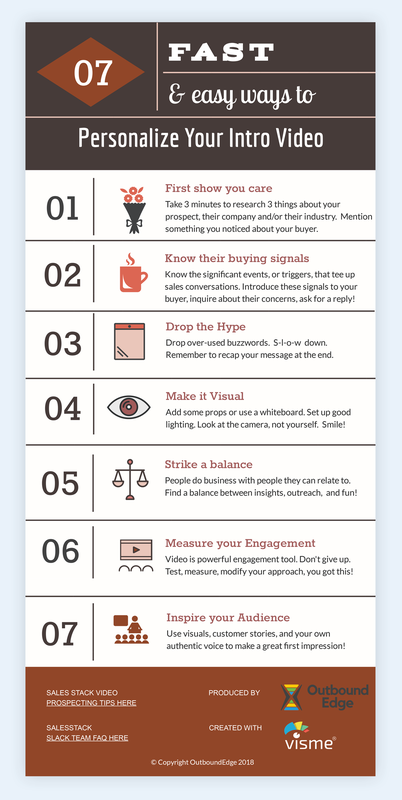 Another reason I use visual content is to equip outbound prospecting teams with video selling skills. 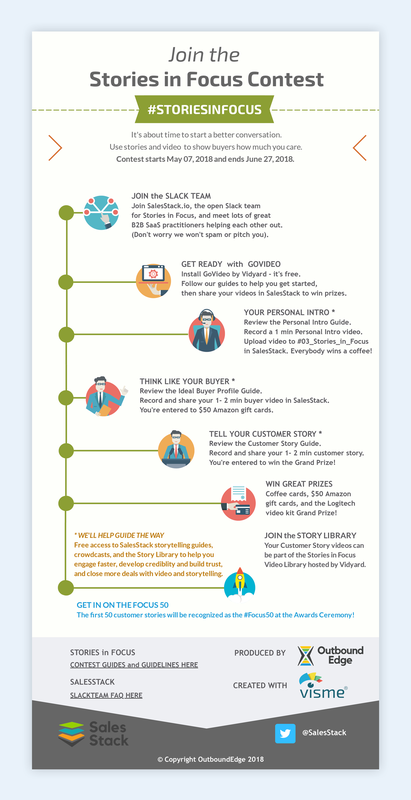 For instance, I created this infographic summarizing the process for participating in our Stories in Focus contest, which challenges sales practitioners to blend video selling and sales storytelling to increase engagement. What tangible business results have you seen from using visuals to communicate ideas? I use Visme with Vidyard GoVideo, a free Chrome Extension, to create 60 second screencasts to promote a weekly webinar series on LinkedIn. Here is one example in which I show sellers how to think like buyers by creating a buyer profile analysis. This has led me to create 3 to 5 new LinkedIn connections every day, and 20 to 30 new webinar participants every week. Using Visme with other tools allows me to tell a story in less than a minute by presenting ideas visually. Screencasting with Visme is a also an effective video-selling approach to stand out in a crowded marketplace. What Visme feature/functions do you like the most? Visual communication is really new in B2B sales, and I love that I can make a really great first impression. 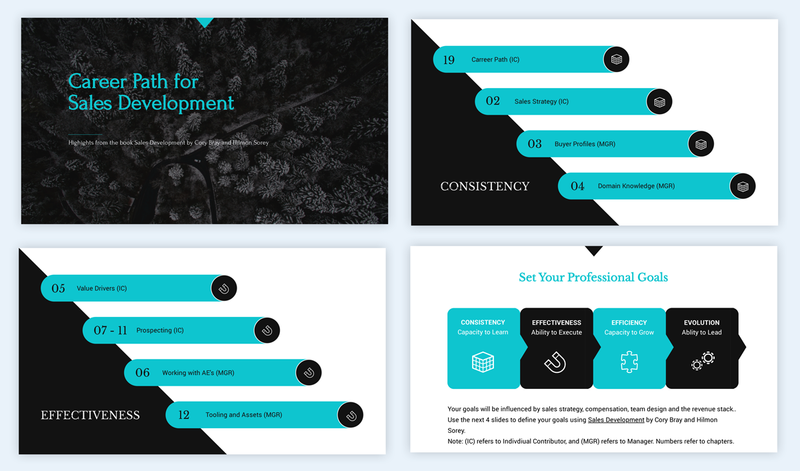 Using the library of presentation and infographic templates, I can quickly publish new content for my LinkedIn screencasting and sales enablement tutorials. I can also customize my tutorials to meet the specific needs of a customer or prospect. Concise visual presentations are a very effective way to communicate quickly in a busy, crowded marketplace. If you need to stand out from the crowd to engage a sophisticated audience with a powerful message then you need a visual communication platform like Visme to create that message. Bullet point presentations and talking head videos are more and more like white noise, especially for a sophisticated visual audience that uses emojis, GIFs, videos and screencasts. With visual communication, and video, you can really engage your audience. What feature/functions do you think are missing or need to be improved in the system? Communicating with diagrams and infographics is not intuitive for most people. It’s hard to know how to associate complex ideas with images in a meaningful way. 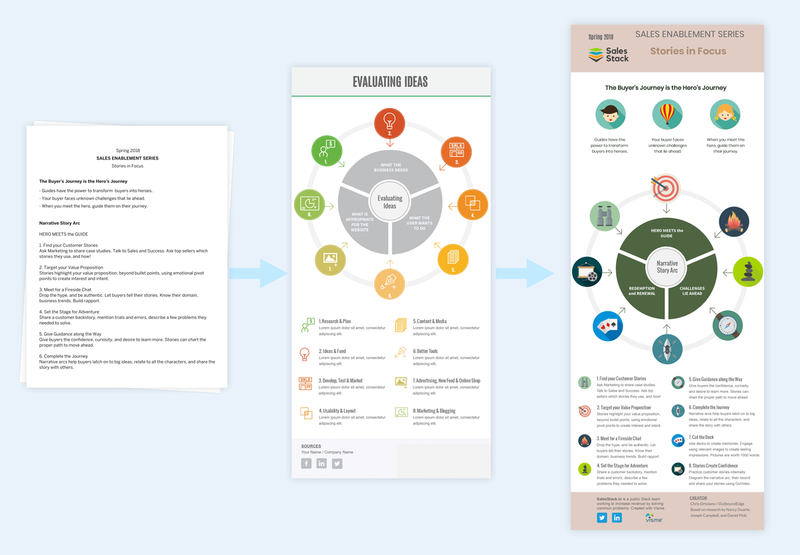 I also have an impulse to communicate too much, leading to very busy (and ineffective) infographics. I think the best way to get started is to write your Visme out on a Word doc, and then associate phrases with images before starting the design process. Access to a tutor or a community of Visme pros in a Facebook group would be really helpful too. Now that I have the hang of it, I’m excited to learn more from other Visme users. Looking for a way to more effectively communicate your ideas to your coworkers, peers, students or classmates? Try visualizing them with Visme. Take it for a test drive for as long as you like and let us know what you think below.